Mr. Willy Wonka needs help in reopening the Chocolate Factory. It’s been a while since it was last operational, so a lot of renovation is needed. Wonka’s World of Candy puts you in charge of the renovation, from fixing broken facilities to choosing designs. 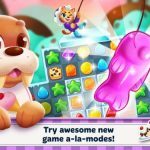 Available on Android and iOS, Zynga’s new mobile game combines the colorful themes of Candy Crush Friends Saga and the decoration mechanics of Gardenscapes. 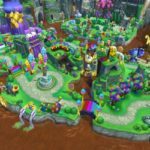 And we have come up with a number of Wonka’s World of Candy tips, tricks and cheats in a complete strategy guide to help you getting a high score! 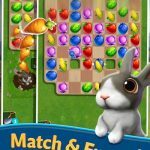 Collect stars by completing match-three puzzles. You can then spend those stars on fixing the different parts of the factory. Various rooms from the movie are waiting for your attention, not to mention the brand-new areas that have never been seen before. You will need to solve over a hundred puzzles in order to fully restore the Chocolate Factory to its former glory. So let’s not waste any of your time and instead let’s move on to our Wonka’s World of Candy cheats, tips and tricks! There are different special tiles that can be created in Wonka’s World of Candy by combining four or more candies of the same color. Depending on the number of candies you combine, each special tile has an added effect. Familiarize yourself with how each one works and how to create them in order to effectively use them in solving puzzles. We have listed the different special candies below to give you an idea on how they work. Rocket – Combine four in a square pattern to create this. Matching a Rocket candy will destroy surrounding tiles as well as a random objective tile on the board. This is great for boards with isolated areas. 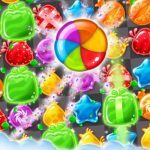 Sugar Beam – Create this by combining four candies in a row or column. The resulting candy will have a vertical or horizontal stripe on it depending on how it was made. When matched, a Sugar Beam will destroy all the candies in its row or column depending on the orientation of its stripe. Fizzy Bubble – Combining five candies in a T or L shape will create this. Matching a Fizzy Bubble will blow up all the surrounding tiles. A second explosion will occur after a few seconds. This is useful for clearing out an area. Everlasting Gobstopper – This is created by combining five candies of the same color in a row or column. Swapping this with another candy will destroy all instances of that candy on the board. Use this to clear a whole bunch of objective candies at once. Colorsplash Cordial – This can be created by combining six candies of the same color. It is pretty rare, but it can be very useful. A Colorsplash Cordial will follow the color of the candy you used to create it. When you swap it with a candy of another color, it will create a splash on the screen that will turn all candies of the same color as the one you swapped with into its own color. For example, swapping a green Colorsplash Cordial with a yellow candy will turn all yellow candies on the board into green ones. If one special tile is good, then two must be better, right? Using two special tiles at the same time will combine their effects and create a bigger one. For example, swapping a Sugar Beam with a Rocket will trigger the Rocket’s initial explosion. It will then fly to a random location where the Sugar Beam will destroy an entire row or column. The better the special tiles you combine, the bigger the effect will be. If you combine two Everlasting Gobstoppers, the entire board will be cleared! Experiment with the different combinations of special tiles in order to come up with more efficient ways to clear the board. Remember, puzzles will get more difficult as you progress. You will eventually reach a point where combining special tiles may be the only way for you to complete a level. Each level will give you a limited number of moves to achieve your goals. That does not mean, however, that you should use up all your moves. When you complete a level with leftover moves, all the unused ones will turn into rockets that will blow up a bunch of candies on the screen. This will push your score by a lot, so it is always worth to leave as many moves as possible. The key is to check the entire board for the best possible move before doing anything. There is no time limit, so you can take as much time as you want before making a single move. It is usually a good idea to make matches near the bottom of the board since it usually results chain combos. Just make sure there aren’t potential special tiles that could be created prior to making matches below them. When you are playing a level, you will notice a bar on the top left side of the screen. The bar has Wonka’s hat at the end of it. When you fill up the bar until the end, the hat will turn gold. That is an indicator that you have reached a Great Score. Ending a level with a Great Score will reward you with bonus coins. You can keep replaying a level until you are able to get a score that is high enough to fill up the bar. Keep in mind, however, that once you get the Great Score bonus, you will no longer receive it from the same level no matter how high your score is. Before you even begin a puzzle, you will be shown what the goals are for that level. Some of them will just require you to collect certain colors of candies. Others will be more complicated like setting some gummy bears free or destroying all cookies on the board. Regardless of the goal, make sure you focus on completing it as soon as you can. It is not just about saving some moves and earning a higher score. If you fail to meet your goals within the prescribed number of moves, you will fail the level and lose a life. That means you will not be given any rewards no matter how high your score was prior to failing the level. You also only get a maximum of five lives at a time. If you run out of lives, you will need to wait for them to regenerate before you can continue playing. If you run out of moves and you still have not met your goals, you will be given the option to continue in exchange for coins. Before you hit that continue button, though, keep in mind that you will only be given a few extra moves to complete the level. That means you will end up wasting your precious coins if you still don’t finish the puzzle after choosing to continue. Make sure you only continue when you have failed the same level a few times and you are finally close to completing it. Otherwise, just hold on to your coins and keep trying. For the same reason that you should not carelessly continue a level, you should also avoid using your power ups. You only get a handful of free power ups in the game, so you should not waste them on levels that you can easily complete. You should also avoid wasting them on a level that is doomed to fail. Try completing a level on your own a few times. If you fail repeatedly and think that a power up will ensure your success, then go ahead and use the power up. Wonka’s World of Candy allows you to link your Facebook account. You will have the option to do so at the main screen, but you will also be asked if you want to link your account after you complete the first few levels. Linking your Facebook account is the only way for you to recover your progress if you change devices. You will also be able to automatically connect with all your Facebook friends who are playing the game. You will then be able to invite them to help you out in your puzzles. On top of that, you get to compete with their high scores in every level. If that’s not enough incentive for you to link your account, the game also rewards you with 1000 coins just for doing it! Even if you don’t have time to play, you should still make time to drop into the game at least once per day. The game gives various rewards for daily logins. The more consecutive logins you make, the better the rewards you get. Daily login bonuses include coins, power ups, and more. If you want to see the list of rewards you will get, just tap on the W icon on the bottom left of the screen then go to the News tab. Tap on the Daily Reward button to view the reward calendar. Keep in mind that the rewards reset every 21 days, so make sure you claim as many rewards as you can before the calendar changes! When you start the game, you will be in Chocolate Landing. This is the first zone that you need to renovate. You can tap on the W icon on the lower left corner of the screen then click on the Map button to see the rest of the areas in the game. You will not be able to go to areas that have not been unlocked, so most of the map will be blank when you first open it. To unlock other areas, simply clear the zone before it. Complete all renovation tasks and you will be able to move on to the next zone. After that, you can freely go back and forth between any of the unlocked zones. The Star tab under the Wonka menu lists down the tasks that Willy Wonka has for you. When you have collected a few stars, you can open up the list of tasks to choose which ones to spend them on. At the top of the tasks list is a bar that slowly fills up as you complete the tasks. Filling up the bar will unlock the gift for you. Gifts contain a lot of coins as well as some power ups. The better further you progress in the game, the better the Task rewards will be. Coins can be spent on a lot of different things in Wonka’s World of Candy. This includes buying power ups, continuing a match, and even buying decorations. While it is definitely fun to buy the more colorful options when redecorating, it is better if you hold off on spending your coins. The game gets more difficult as you progress, so you may need your coins to help you complete higher levels. Once you have a surplus of coins, you are free to spend them however you like. In the meantime, just settle for the free decoration options when renovating the different areas in the Chocolate Factory. If you have reached the point where you have some spare coins to spend on decorations, or you just feel like switching to a different design, you can change as often as you like. Simply tap on any of the areas that have already been decorated. The game will bring up the options once again, so you can choose whichever you want. If you have already bought the paid décor options, don’t worry about replacing them. You won’t need to buy them again if you decide to switch to a different option. Of course, free decoration options will remain free. This gives you the freedom to redecorate the Chocolate Factory as much as you want. It is time to create your own Chocolate Factory in Wonka’s World of Candy! Just follow our Wonka’s World of Candy cheats, tips and tricks above and you will be getting top scores in no time!